I know that the Hawaii tsunami is now officially old news, but it was an important geological lesson. Why does it take amateur video to adequately explain what was happening? As I watched cable news yesterday, the activity was hidden by screen banners and obscured by blathering newsreaders who didn't have enough knowledge to realize what was happening on the screen in front of them. I've been complaining about it for the last 24 hours, so I thought I should mention what incredible things we did see yesterday. It boils down to the fact that there was a very thin line between a geologic curiosity and a geologic disaster in Hawaii yesterday. Think what a remarkable thing was happening in the video: a normally placid ocean bay protected from wave action by a long sea wall was suddenly full of mud, and was flowing. First one direction, then the other. How extraordinary is this? Normal waves are a surface phenomena. Anyone playing in the waves at the beach knows they can avoid being mashed by a big wave by diving under it. The waves form up only a few hundred feet offshore and break against the beach. They involve a limited part of the water column, and the energy level, while high at the point of impact, is also limited. The swells that form up into waves may be generated hundreds or thousands of miles away by storm winds, but the swells travel only a few tens of miles an hour, and the turbulence extends only a few tens of feet beneath the surface of the ocean. Tsunamis are not at all like normal waves. They are generated by a displacement of the water on the ocean floor by large earthquakes, volcanic eruptions or underwater landslides. They travel hundreds of miles an hour (roughly the speed of a jet airliner), and they affect the entire water column from the seafloor to the surface. They don't even really affect boats on the open ocean, as the boats simply rise and fall a few feet over a twenty minute time span. But the seafloor is affected by the passage. The dangerous aspect of a tsunami is what happens when the waves encounter shallow water along a shoreline. In essence, the energy of the wave that has been dispersed across the whole water column is compressed into a smaller and smaller space. The wave builds, and either draws water away from the coast, or surges into the coast without warning. The activity at Hilo Bay is a wonderful example of the process. All the water in the bay was in motion, from the surface to the base, and this is what kicked up all the mud in the water. The water was surging in and then out again, explaining the strange currents around Coconut Island, seen in the video above. The total height of the tsunami surge was about three feet. This was a huge earthquake in Chile, the fifth largest ever recorded. It was reasonable to expect a colossal tsunami, but tsunamis are subject to many variables. Smaller earthquakes have generated larger tsunamis in Hawaii (the worst tsunami to strike Hawaii, in 1946, was from a smaller earthquake that took place in Alaska). The largest earthquake ever recorded, from Chile in 1960, produced a devastating tsunami in Hilo, but the second largest, the Alaska quake of 1964 (magnitude 9.3) caused all of $60,000 in damage and killed no one in Hawaii (16 people died in California and Oregon, and 106 in Alaska). In other words, tsunamis are inherently unpredictable. In the worst tsunamis, of 1946 and 1960, the surge reached depths of 30 feet or more. A warning system has been present in the Pacific Ocean basin since 1946, and the system was upgraded in the last few years, but has only been tested in a few recent large seismic events. What I really wish is that the newreaders (er, um, excuse me, anchorpersons and reporters) at the cable networks would take the time to truly educate themselves in the basics of geology. As a teacher of geology, I shiver at the thought of standing up in a classroom of philosophy students and lecturing on philosophy without any time to prepare. These newspeople are standing up in front of millions of people and displaying their appalling ignorance of geology. The other problem, of course, is that their audience is not aware of it. UPDATE: Chris at goodSchist is collecting some of the mainstream media crimes against geologic understanding here. Be sure to contribute if you see something! I have a dream, or more a fantasy, because dreams are more likely to come true. I fantasize about the day that a cable network newsreader (I know they like to call themselves "anchorpeople", but forget it) stands up in front of the television cameras and says, "I'm sorry, but I and the entire news team in this room and on the site of the geological event out there haven't got the faintest idea of what we are babbling about. So we are going to suspend our coverage until we have hired a correspondent who has the scientific education to give us a cogent and reasoned explanation of what is going on." My dream isn't going to come true, is it? As I noted yesterday, the networks will spend tens of millions of dollars to cover minute aspects of sporting events, but they can't shell out, say, $90,000 a year to a competent geologist/earth scientist who can warn them that they have gone overboard on the hype, and to calm down. What was the real story yesterday? There was a massive earthquake in Chile yesterday, an 8.8 magnitude monster that was the fifth biggest tremor in recorded (i.e. on a seismometer) history. It produced a tsunami that would affect the entire Pacific Ocean basin. The coverage of the earthquake itself earns the news networks a C+, because they apparently still remember some of the science they learned six weeks ago in Haiti. But...their coverage of the effects of the quake on the Pacific Basin and Hawaii? An F. Not even a gentleman's F+. They've done grievous damage to the entire concept of responsible journalism. They hated that the Indonesian tsunami struck without warning so that they couldn't plan for their coverage of a tragic human event. So this quake hits, and they have a half day's warning to prepare for the event in Hawaii. They were so incompetent that they could position stationary cameras in what seemed to be only three locations (including what seemed hours of pictures of one moronic surfer), and then breathlessly babbled for hours about the approaching maelstrom. The tsunami arrived, and they didn't recognize it happening in front of them. Then they acted disappointed that it wasn't the disaster they had been building up for hours. And they cut to commercials. This, of course, is what I was raging about yesterday. The story they missed? A giant earthquake produced what could very well have been a colossal tsunami. The civil defense apparatus of the state of Hawaii gears up for the event, sounding the warning sirens hours ahead of the arrival of the tsunami surge, and doing an incredible job of warning the population of what could be coming. The people of Hawaii do the right thing, stocking up on emergency supplies and taking shelter in the appropriate locations. The evacuations run smoothly, from what little I hear, and if a monster tsunami had hit, the death toll would have been very low. The tsunami hits with an intensity at the lower end of the predictions, and a number of fascinating phenomena take place (and I am still waiting for some decent coverage of what actually happened). There was a collective sigh of relief, and life returns to normal, after a brief interruption and a little inconvenience. That was the real story, and it was for the most part untold. The damage they have done? By building up the story to a fever pitch, they could have caused unnecessary panic and worry, and when they expressed their disappointment (in their attitude, if not their words) at the outcome, they set up a situation in the future where people might not take tsunami warnings seriously. They have turned this into a "Peter cries Wolf" story in which the civil defense people actually seem to be apologizing for overestimating the size of the waves (and please follow and read the link). The Pacific Tsunami Warning Center has nothing to apologize for; they acted appropriately for the situation, and the population responded well. I can only pray that in future events they will also respond correctly. My friend at Phreatic Ramblings captures a particularly inane conversation that took place yesterday. I normally like Rick Sanchez if he is talking about politics, but he didn't do so well here. What? You Were Expecting This? If you were watching the coverage of today's tsunami in the Pacific Ocean basin, you could be forgiven for thinking that this was what was converging on Waikiki, given the breathless reporting that took place on the cable networks. This photo began life as a photoshop effort that circulated on the internet in the days following the Indonesian earthquake and tsunami of 2004. It wasn't enough that the tsunami killed hundreds of thousands of people throughout the Indian Ocean. Someone had to try and make it seem bigger (if someone actually wants to admit owning a copyright to the photo, let me know and I will take it down if you wish). I began the day being somewhat impressed with the quality of the discussion of the massive earthquake in Chile. Some of the newsreaders displayed some level of knowledge about just how big the quake was (the 5th largest ever recorded in the last hundred years or so) and something of how quakes are assessed and measured. But then the scene shifted to Hawaii and I became more and more disillusioned. What a wonderful opportunity to educate an audience on the nature of geologic hazards and processes! A tsunami was coming and the story would unfold in front of the world. We would be able to see it happen and even better understand what was happening. What took place instead? Four or five wasted hours of breathless useless words, an unrealistic build-up to a climax that wasn't going to happen, and a near total misunderstanding of the extraordinary thing that did happen right there on the screen in front of us. The arrival of the tsunami was obscured by one of those ridiculous banners (which I could almost swear said "BREAKING STORY: HAWAII ABOUT TO WASH INTO THE SEA", but I could be mistaken). The newsreaders went on babbling, blithly unaware of what was happening on the screen. Because it wasn't killing anyone, I guess. But I forget myself...of course television exists only to sell commercial products, and the only way products will be sold is if millions upon millions of people are watching. News is merely a means to an end, and the end has little to do with educating the public. But who am I to complain? I'm just a geologist and teacher who felt horribly disappointed today at what could have been. I think about the Olympics I've been watching this week...tens of millions of dollars were spent designing a media extravaganza in which every aspect of every sporting event could be seen from three or four different camera angles. There seemed to be hundreds of expert commentators who could describe every single move made by every single athlete. Every triple-toe-lutz, every slalom turn. But to describe a geologic event of worldwide importance and interest? With twelve hours of lead time, the networks got all of one camera pointed to Hilo Bay?? As far as I am concerned, the day was an epic fail by the news media. I see little evidence that the cable networks employ even a single scientist. The only scientists ever in evidence are the "meteorologists" but does anyone think they were chosen for their expertise? Screen presence is everything, of course. Most of the weather people show a shocking ignorance of climate science and the issues involved in global warming and climate change. Of course when a volcano erupts or a fault slips to produce an earthquake, the network newsreaders interview volcanologists and geologists. But they almost never ask the right questions, and half the time they are looking for the answers that feed their preconceptions and the need to increase viewership. Am I being too tough on the cable networks? What do you think? I take back the nice things I said about the media coverage. They have the tsunami directly affecting Hilo Bay, but they keep putting their "breaking news" banner right over the most visible aspect of the receding water as the tsunami hits (see the unblocked picture above). And then they keep going back to Oahu where absolutely nothing is happening, or repeating pictures of the same stupid surfer from three hours ago. They have a tsunami happening in front of them and don't seem to realize it. A big learning moment is passing them (and us) by. A reporter on one of those channels says they are hoping for the best...but to be cynical, if the best happens, I suspect there will be much gnashing of teeth about Chicken Little and "inaccurate" predictions of an inherently unpredictable event. The photo is Coconut Island in Hilo Bay. 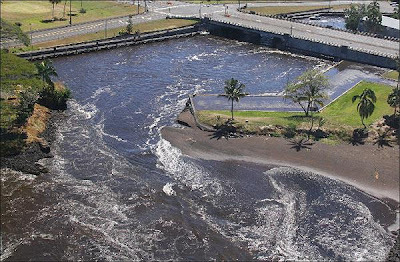 In 1946, a horrendous tsunami overran the small island, and swept into downtown Hilo, killing more than 100 people. Today's event is thankfully much smaller, though it is not over with yet. All the news networks went to commercials. I guess the tsunami is over (it's not, but it wasn't big enough to keep their interest). The tsunami has in fact caused at least some fatalities, just not in Hawaii, and notably not mentioned on the networks that I can tell (on islands closer to Chile). A more comprehensive live blog about the earthquake and tsunami on a more worldwide basis can be found at EnduringAmerica. I suggest checking there for some straight blogging without my opinions of the media coverage. Also, as predicted, the weasels in the media are complaining about a "false alarm". They seem almost disappointed that there wasn't any widespread death and destruction in Hawaii. At the end of the interview with someone from the Warning Center the newsreader admitted that the waves actually did reach the proportions predicted, just at the lower end of the prediction range. There wasn't a whole lot of information when I wrote about the 8.8 earthquake in Chile in the earliest hours of the morning. Information is starting to flood in now from many sources, and my first impression is media coverage is a bit better than it was for the Haiti quake and other earlier events. When I say "better", I don't mean more cameras, I mean evidence of an effort by the reporters to educate themselves about the basic science of earthquakes. My first thought is for the people who have been affected, both in Chile and across the Pacific basin. A quake this big is going to have huge impacts. The aftershocks are going to be an issue: my USGS notifications are set for any quakes bigger than 5.5 and there have been 11 of them so far, with the largest at 6.9. For perspective, 6.9 is the size of the Loma Prieta earthquake here in California from 1989. It killed 4 dozen people and did around $10 billion in damage. The quake in Haiti was a somewhat larger 7.0. Aftershocks are going to continue for a long time, over a region about 600 miles long (the size of the fault zone that shifted in this quake). 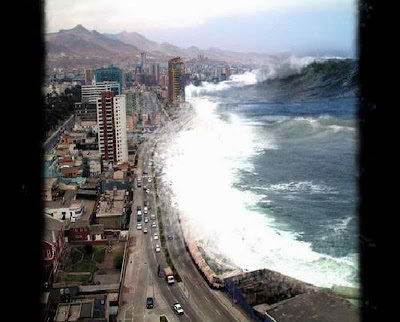 The tsunami is a huge threat. The size of a tsunami in any particular place is dependent on many factors, including the size of the earthquake (which was colossal), how the quake transferred energy to the ocean water (unknown to me at this point), and the shape and depth of the coastline where the tsunami strikes. All I can say to my Pacific Basin friends is that when the Civil Defense folks set off the sirens, take it seriously! Hawaii in particular has a tragic history with tsunamis, and there has been a vast amount of coastal development since the last major tsunami (in 1960, also caused by an earthquake in Chile). There will be a big problem of people wandering down to the beach to watch the tsunami, which can only be described as an act of idiocy. Get to higher ground or higher floors. If the warnings are inaccurate, you've only lost a bit of time, but if they are accurate, your life will be saved. Don't go to the coast until the "all clear" is given, because there will be more than one surge of water. You can't swim your way out of a tsunami; they are one of the most dangerous of geologic events, as the Indonesian tsunami of 2004 demonstrated. A huge earthquake has struck offshore of Maule, Chile. Initially reported at magnitude 8.3, the quake has been upgraded to 8.8, making it the sixth largest quake recorded in the world since 1900 (if the revision stands). A tsunami warning has been issued, but there are no reports out of the region yet whether it has materialized. Power outages have been reported in Santiago, but no other reports of damage yet. Needless to say, such a quake is capable of doing grevious damage (the energy of this quake is hundreds of times more than the 7.0 quake that hit Haiti six weeks ago). An exploration of the Klamath Mountains of California is not complete without a discussion of...well, let me mention a field trip story. The punchline isn't very exciting, but here goes. We take a field studies trip to the Cascades every other September. To split up some of the long drives, we leave on a Thursday afternoon and drive to a state park on the Sacramento River near Red Bluff. We usually arrive about 9:30 at night, at which point we roll out our sleeping bags and get a good night's sleep before really starting our class the next morning. Sometimes we have complications. One time we arrived to find the entire campground occupied by a convention of ultra-libertarian, almost-militia type folks having a barter fair. We had to barter with a very drunk organizer who was suspicious that we were members of the federal guvmit to negotiate out a little corner of the campground for ourselves. We had kind of a nervous evening. Another year we had a different problem: we arrived and the entire campground was closed for renovations! I wasn't quite prepared for this, and we headed north on the highway looking for another place to stay. It took us a couple of wrong turns looking for a non-existent camp along the Sacramento River ("it's on the map, dangit! "), but finally around midnight we found a KOA that was willing to take in 30 weary travelers on short notice (and for a price). It was nice of them to put up with us, but it was an unremarkable place except for the men's bathroom. It had a giant diagram on the wall of all the Sasquatch sightings in northern California! We were in Bigfoot Country! A discussion of Bigfoot is going to carry us into fringe territory along with UFO's, Lemurians, Atlantis, ghosts and who knows what, but at least Bigfoot is regarded as "fun". No one seems to think that they are plotting to take over the human race, or that they are attacking and eating people (apparently president Theodore Roosevelt provided the only exception). So why won't biologists and other scientists accept the existence of Sasquatch? After all, there have been hundreds, maybe thousands of reported sightings, along with dozens of photos and footprints, especially since 1958 when tracks were found around the equipment at a logging camp (tracks made by the company owner to scare away vandals). We live in a visual society...why aren't photos enough? I've been having fun reading some discussions lately about whether Yosemite's Half Dome can be seen from the floor of the Central Valley in California. The main evidence lies in a dozen or so photographs that have been posted on the internet by different individuals (including me). The interesting aspect of the discussion has been the many skeptics who insist that Half Dome absolutely cannot be seen from the valley, and who charge that the photos are an elaborate photographic hoax. So...a few people say it CAN be seen and offer a few grainy photographs, versus expert photographers and hikers who clearly know that it CAN'T. Isn't this the same situation that we have with Sasquatch? Not really equivalent at all. Despite any arguments and calculations that can be offered by detractors, all one has to do is go to the right spot on an unusually clear day in the Central Valley, and there it is. Half Dome isn't going anywhere, and confirmation is easily achieved. On the other hand, if Bigfoot-Sasquatch were an actual living species, the implications would be staggering. A second hominid species, a large one, living in North America alongside humans would be an astounding discovery. How did it evolve? How closely related is it to Homo sapiens? How can it have escaped discovery despite the intense development of the western states and the intense logging activity in the places where the species lives? And if the existence of the creature were to be in some way confirmed, what are the legal ramifications? Endangered Species Act? Would they be placed on reservations? (yes, that question is an indictment about government attitudes about First Nation/Native American people). In a word, it would be extraordinary. So here is the problem: there isn't a shred of physical evidence that Bigfoot exists that can be subjected to any kind of scientific scrutiny: there are no bones, either recent or ancient, no droppings, no nesting/bedding sites, no artifacts, no bodies, no fur. Wildlife biologists will happily admit they were wrong when the physical evidence appears, but in a century of searching, nothing has emerged. And consider something else: motivation. When we were accused (in a good-natured way, I hope) of being hoaxers in the Half Dome affair, I would have to respond: what do we have to gain? No one is going to pay us thousands of dollars for a grainy, slightly out-of-focus picture of Half Dome (not that I would turn down an offer!). 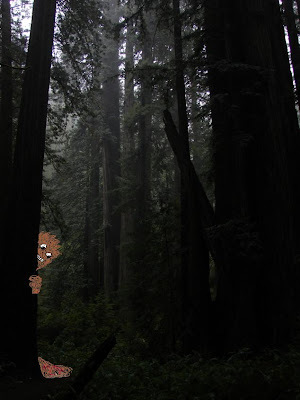 But if I said I had a genuine picture of a Sasquatch (and I were a talented photo-manipulator; see the photo above! ), I could potentially earn a fair amount of publicity and cash, even if the photo is later revealed to be retouched (the picture above is real, dangit, I swear it with my fingers crossed!). Could Sasquatch really exist? Of course. But it is extremely unlikely. The evidence to confirm the existence of Bigfoot would have to be overwhelming. A century ago, a German meteorologist named Alfred Wegener said that continents had been drifting about the planet. Scientists were unconvinced by his evidence, which involved rock similarities, fossil similarites, and paleoclimate similarities. It was good scientific data, but geologists were able to offer alternative explanations that did not require movement of continents. It wasn't until new discoveries in the 1950's and 1960's in unexpected disciplines like paleomagnetism, and new technology became available that revealed details of the ocean floors that Wegener's hypothesis was accepted. In the process, the idea grew into a much more encompassing theory called plate tectonics (make no mistake: a theory is accepted scientific fact; it is hypotheses that are unconfirmed potential explanations). The fact that his hypothesis came to be accepted doesn't mean that any fringe science is automatically true. Scientists in all disciplines pretty much have to be skeptics by nature, and fringe ideas must meet the same exacting standards of evidence that any other hypotheses must meet. 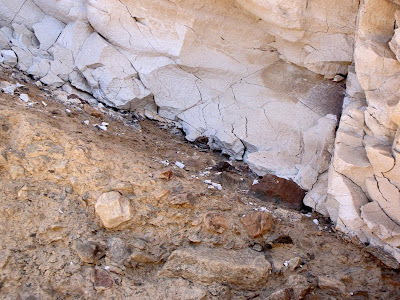 In most parts of the world, the geological story can be teased out by following some basic rules of stratigraphy: in a sequence of layers, the oldest is usually found at the base; if a layer appears in the side of a cliff, we can reasonably expect that it will found to continue at another location nearby. Sediments usually form in horizontal layers. These principles were realized three hundred years ago by Nicolas Steno, and ultimately led to the establishment of geology as a science. Geologists were able to use these principles and a growing knowledge of sedimentary structures and facies to work out a reasonably accurate story of the history of the crust in many parts of the world. In regions like the Alps of Europe and the Appalachian Mountains in the eastern United States, the early geologists were able to unscramble incredibly complex rock sequences because they were able to correlate formations from one mountain ridge to another. Fault lines were not necessarily a problem; walk far enough and you could find a continuation of your missing layers somewhere along the other side of the fault. The rules seemed to apply, until the geologists arrived in California. There are places in the state where the rocks are so chaotic and discontinuous that geologists with the classic training in stratigraphy had to throw up their hands in frustration. Following an outcrop? Great, there's a fault. We'll look for a continuation of the layer. And look. And look some more. And never find it. What are these older rocks doing on top of these younger rocks? That doesn't make sense. And why can't we find any fossils in many of these rocks? They're sedimentary, they should have fossils. California was an enigma and a chaotic mess to the first geologists who tried to pry loose her secrets in places like the Coast Ranges, the Transverse Ranges, and the Sierra Nevada. There is a region that is pretty much the epitome of the chaos that is California geology. Tucked between the Cascades and the Coast Ranges of Northern California, the Klamath Mountains rise to elevations of just over 9,000 feet, and essentially resemble a large plateau that has been deeply dissected by stream erosion, especially along the Trinity and Klamath Rivers. 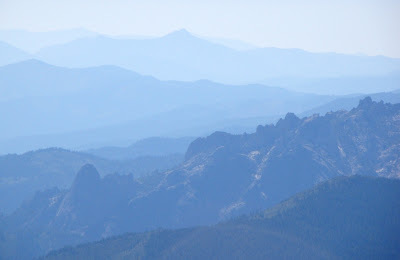 The Klamaths are divided by geographers into a number of subordinate ranges, the Siskiyous, the Trinity Alps, the Marble Mountains, and others, and most of the country is untrammeled wilderness. The Klamaths are a lesson in geology contradictions. Almost every kind of marine environment shows up somewhere, shallow nearshore deposits, coral reefs, carbonate shelves, deep ocean muds and trench deposits, but in close proximity are found unusual igneous rocks derived from the deep mantle and the base of the ocean crust. Here and there the rocks are intruded by granitic plutons much like those of the nearby Sierra Nevada, but also there are granites that are much older. Everywhere there are faults. Mostly they are thrust faults but occasionally normal faults are found, indicating that both compressional and extensional forces have affected the rocks. 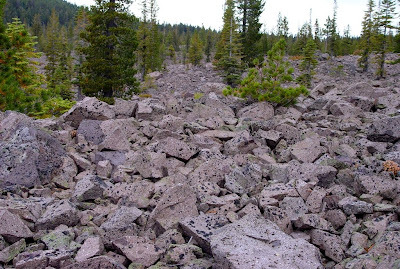 The key to unraveling the mysteries of the Klamath Mountains was to stop trying to make logical sense of the rocks! There was not a single sequential story to be deciphered for this part of the world at all, there were a multitude of stories, stories that unfolded in many different places around the planet. One of the first researchers to make this connection, W.P. Irwin (in the early 1960's), divided the rock sequences into a series of "belts" that seemed to have originated in places other than the Klamaths. This model evolved into the concept of accreted terranes, a pioneering idea that played a central part in the acceptance of "continental drift" and plate tectonic theory in the late 1960's. Translated, a terrane is the crustal equivalent of the debris that collects in a river eddy: the floating branches, leaves, bits of styrofoam coolers, and plastic bottles. 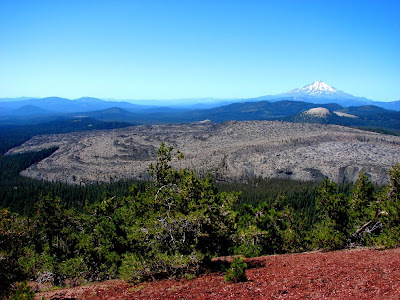 In this case, the Klamath Mountains were a collecting point of various bits of ocean crust and continental fragments in the eastern Pacific region during Paleozoic and Mesozoic time. Four major terranes were originally identified in the Klamaths by Irwin: the Eastern Klamath, the Central Metamorphic, the Western Paleozoic and Triassic, and the Western Jurassic. With continued research, these have been subdivided into many subterranes. 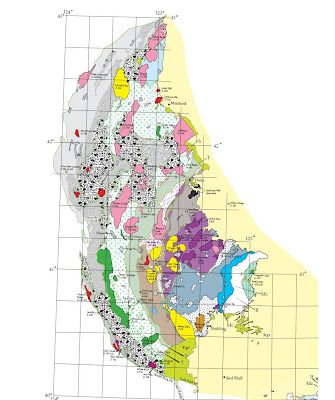 A hint of the complexity can be discerned in the geologic map shown above, which is part of an effort to correlate the terranes of the Klamath Mountains to those in the northern Sierra Nevada. A bit of a plea: Geotripper needs your help! I've explored a lot of California, but not so much in the Klamaths. Do you have a favorite spot you would like to share? Be a Geotripper Geoblogger for a day, and tell us about it! *The Terrane Puzzle: New Perspectives on Paleontology and Stratigraphy from the North American Cordillera, edited by Robert B. Blodgett, and George D. Stanley, Jr.; Geological Society of America Special Paper 442, page 2. New Blog on Northwest U.S. Geology: Road Trips! 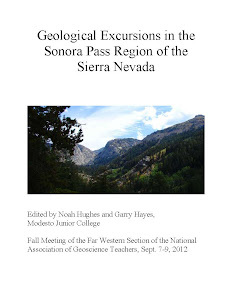 Are you interested in geology field guides for the northwestern United States? You might want to check out a new blog by Dave Tucker at Western Washington University: Northwest Geology Field Trips. It has a wealth of information and some fun looking trips; check it out! Dave is also the director of the Mount Baker Volcano Research Center, which has a website here. For those who are less familiar with the volcanoes of the Pacific Northwest, Mt. Baker seemed to be on the verge of erupting in 1975-76, and has had a fair amount of activity in late Pleistocene and Holocene time. That's Mt. 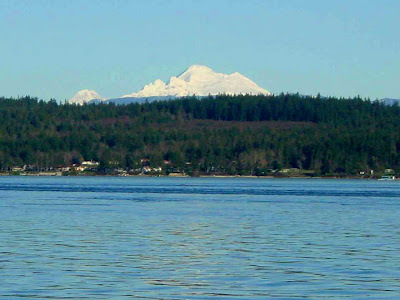 Baker in the photo above, as seen from Whidbey Island. The Redlands Earthquake Swarm: California Has Her Faults; Lots of Them! A swarm of small and moderate earthquakes has been shaking things up in Southern California in and around the town of Redlands. The largest, on February 13, was magnitude 4.1, with five additional events between 3.1 and 3.6 in the days that followed. Well over a hundred smaller quakes have been detected as well. Swarms are interesting and exciting if you live on top of them, but they don't usually signify bigger things; the earth is shifting a bit, and that is often the end of it. On much rarer occasions, they may be a sign of an impending larger event, a foreshadowing disturbance of the earth similar to the cracks and pops a tree branch makes before it breaks (disclaimer: I am NOT making ANY kind of prediction; I don't have any access to data, nor do I have the background to do so, and seismologists know better than to try and make a short-term prediction of any quake). My message for the day is to remind people who live in earthquake country that they should ALWAYS be prepared for a large seismic event. There is another opportunity here: a lot of people, when they hear of quakes in California, think San Andreas Fault. Many California residents who have lived here all their lives cannot think of the name of another fault in the state, but our landscape is literally crisscrossed by active faults (look at the map above; most of the brown lines are active faults). Most earthquakes in CA happen on faults other than the San Andreas, and this week's swarm is no exception. It appears to be taking place on one what is arguably the most active fault in the state, the San Jacinto fault. The San Jacinto fault is certainly part of the San Andreas system. 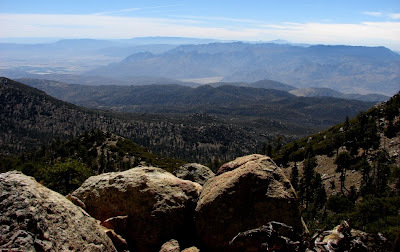 It splits off from the San Andreas at the east end of the San Gabriel Mountains, and runs roughly parallel to the San Andreas for 140 miles south into the Imperial Valley. It has the same type of motion, right lateral (features on the opposite side of the fault have been shifted to the observer's right). Since it began moving a few million years ago, something like 15 miles of lateral motion has taken place. 1890 - Magnitude 6.5 that occurred in the "San Jacinto or Elsinore Fault region". 1892 - Another magnitude 6.5 occurred in the same region as the 1890 earthquake. 1899 San Jacinto Earthquake - Magnitude 6.4 earthquake destroys San Jacinto and Hemet. 1918 San Jacinto Earthquake - Magnitude 6.9 earthquake strikes the same area that was damaged by an earthquake 19 years earlier, with an epicenter roughly 10 mi NW of the previous earthquake. 1923 North San Jacinto Fault Earthquake - Magnitude 6.3 earthquake damaged the San Bernardino and Redlands area. Last time the fault, which runs under the I-215/I-10 interchange, ruptured in this area. These quakes are considerably smaller than the 1906 event, by a factor of 32 or more (it takes the energy of 32 magnitude six quakes to equal the energy of a single magnitude 7 quake; a magnitude 8 quake is 32 times more powerful than a magnitude 7 quake and more than a thousand times more powerful than a six). But they clearly happen more often . The message is clear: to live in California, we must be prepared not just for the BIG, HUGE ONE, but also lots of lesser BIG ONES. I am always kind of haunted (in a good way) by ancient petroglyphs and pictographs. Most of my teaching in a classroom involves delivering information using one kind of rock (chalk) to form images on another kind of rock (slate, or an artificial derivative of slate). My images are far more transitory (they last right up to the moment the custodian erases them), but I feel an affinity for those who left images in stone hundreds or thousands of years ago. They were telling a story, sometimes with an obvious message (bighorn sheep here! ), and sometimes with symbolism and codes that are long lost to history. I'm back from our field studies journey in Death Valley, but I'm still finding a bit of material to post. We were out on the last day, making our way south out of the valley over Emigrant Pass and Wildrose Canyon. In a drier year we would have paid a visit to Aguereberry Point or the Wildrose Charcoal Kilns but snow and ice prevented us from doing so. With the additional time we paid a visit to some striking petroglyphs on a rhyolite ash flow of the Nova Formation. They depict animals, as seen above, and quite a few indecipherable symbols. Although one should NEVER touch the rock art, nor should one do rubbings, it is certainly a temptation! I wanted to reach up and touch this surface that was another's message. It's a moment of communicating with a fellow human being across the centuries (don't worry, neither I nor any of my students were touching the petroglyphs!). While looking at the rock art, I took a step back and looked at the canvas the artist had chosen: an outcrop of tan colored rhyolite ash perhaps 30 feet thick. 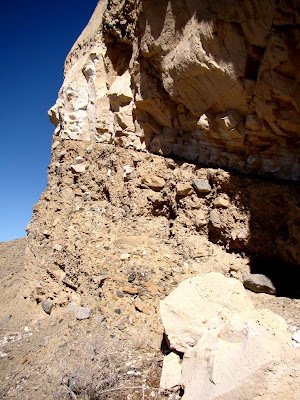 It lies interbedded with the conglomerates of the Nova Formation, which formed in a series of chaotic basins that developed over an extending terrane in the Panamint Mountains between 5.4 and 3.1 million years ago (the Emigrant Detachment). 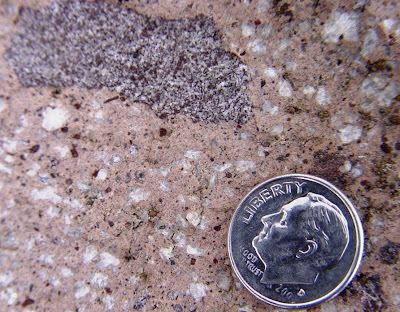 The rhyolite ash was formed in a violent explosion that inundated the region with the white powdery material. I looked closer at the rock and was struck by the absolute starkness of the basal contact. I was looking at a single moment in time, a matter of a few seconds from a momentous event several million years ago. It was a castastrophe. This was an alluvial fan surface. A rugged mountain close by was shedding debris via streams, floods and mudflows, leaving a rocky landscape. It could have been a sunny day, maybe cloudy. 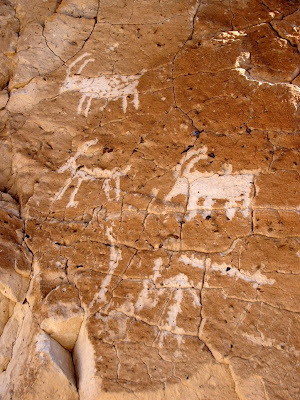 Vegetation was growing among the rocks, and a variety of large animals were grazing nearby: numerous species of horses and camels, antelopes, mastodons, and the carnivorous animals, ancestors to today's canids and felines. There was a vast rumbling, a huge explosion ripped into the sky, and darkness quickly engulfed the area. Animals surely tried to escape, but there was nowhere to go. They were buried. Their last moment is memorialized by a thin line in a cliff that divides a conglomerate from a white ash layer. I'd Like To Speak to your Site Engineer, and uh, Why Are You Strip Mining Our National Park? Who in the world chose this particular slope to build the offices and dormitories for the mine complex near by? Maybe the perspective makes it look steeper and more dangerous than it actually is, but every single piece of rock on that slope came down quite rapidly from the cliffs above. Maybe someone familiar with the site can explain to me how those buildings aren't deathtraps. 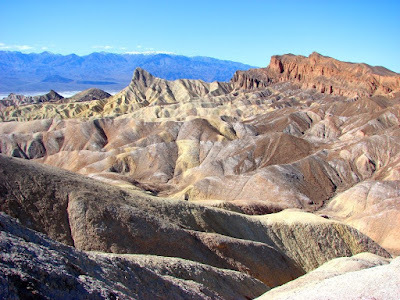 The first Europeans to fully experience the delights of the Death Valley region were the Forty-Niners who got marooned on the valley floor for several weeks after running out of supplies. They gave the valley its name, even though only one of the travelers actually died. But the real pioneers were the miners who soon followed. A lot of dreams of avarice and riches died in the vicious desert environment, and few of the mines ever actually paid dividends to their owners. A big exception was the mining of borate minerals, used in soap-making, glass-making and a wide variety of other industrial uses. Borates were a rare resource in the world prior to the 1870's. 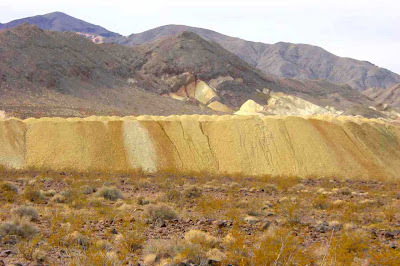 They were discovered in California during the 1860's in the Clear Lake area, but it wasn't until large deposits were found in the Death Valley region in the 1880's that serious mining took place, despite the extreme isolation. The nearest railroad depot was near Barstow, more than a hundred miles away. The mining companies designed the twenty-mule team wagons to transport the ores, and the wagons became an enduring symbol of the company even into the present day. The mines were active until borate minerals were found in the Calico Mountains near Barstow, right next to the railroad depot. The Death Valley mines were immediately idled. A failed agricultural well near the present-day town of Boron in 1927 revealed the presence of a vast body of borate minerals underneath the desert floor, and a giant open pit mine was quarried. It continues to provide much of the world's supply of borates, despite an ongoing bitter strike. Old mines, with their headframes, tailing piles and associated ghost towns, are a colorful part of the history and heritage of the Death Valley region. Which makes the scene below all the more jarring. It is a modern open pit mine along the road to Dante's View above Zabriskie Point. Even though the region was made a national monument in 1933 (and a national park in 1994), prior existing claims were honored and mining continued on a small scale. The initiation of highly visible open-pit mining operations in the 1970's elicited storms of protest, and Congress changed the laws controlling mining in the parks in 1976. 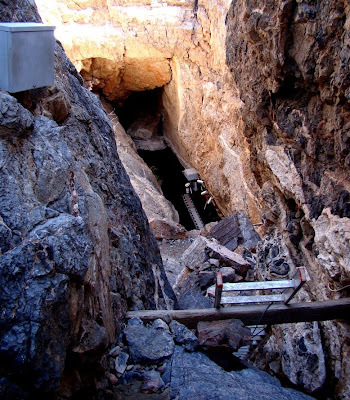 The underground operations of the Billie Mine at Ryan (seen in the picture above) ended in 2005, so at this time no mining is taking place in Death Valley National Park. 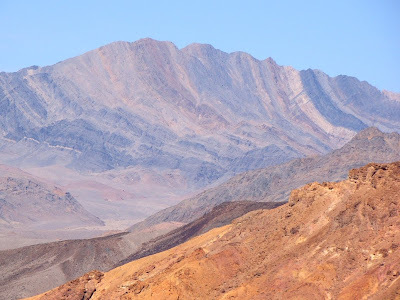 The Park Service has some excellent sites describing the history of mining in Death Valley here and here. What isn't clear to me is whether the tailings from the 1970's operations will ever be cleaned up. 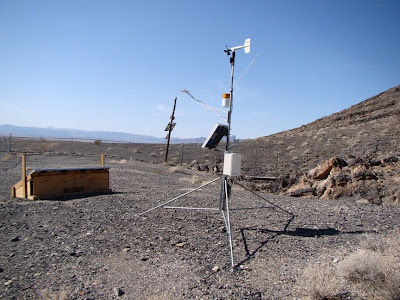 I am writing this blog post today in penance for my faux pas the other day in describing the "climate" at Death Valley as "unusually wet" this week. It was the weather that was wet, not the climate. It was a sophomoric mistake, made worse in my mind because of the cacophony of idiots who decided that global warming and climate change are myths because it snowed in Washington D.C. last week. Changes due to global warming are happening all around us. To deny it, like many conservative politicians and talking heads are doing, is comparable to saying the Titanic isn't sinking as the water laps around one's ankles. Over at High Country News, "Writer on the Range" Tim Lydon offers up a bucket list of those places to see, not before we die, but before they disappear due to the effects of global warming and climate change. He concentrated on Alaska, ground zero for the effects of warming climate, and areas like Yellowstone and Glacier National Parks in the lower 48 states. It brought to mind some places I need to see soon. 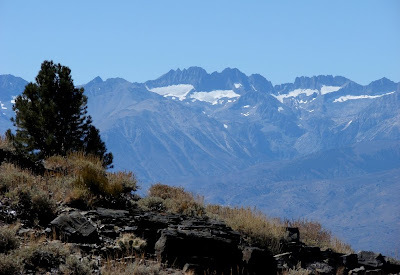 Lydon notes the glaciers in Glacier National Park may disappear in as little as a decade, but California has her glaciers too, including the Palisades Glaciers, seen above in a view from the White Mountains across the Owens Valley. The glaciers of the Sierra have lost something like 75% of their volume over the last century. They won't be around long, and I've only hiked up to one of them. Another part of our heritage that may disappear is the relic forests of the Mojave. 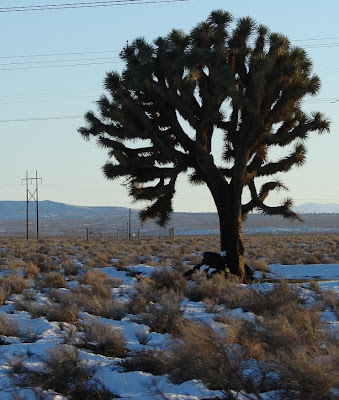 During the ice ages, forests of conifers extended across the Mojave Desert and Basin and Range Provinces. Adapted to wetter conditions, the species retreated as the region became a desert, and most of the forests disappeared until a few small islands remained. These include small white fir forests at the summit of Kingston Peak and the Clark Range. I've never seen them up close. The Joshua Trees are losing ground as well. They will probably be present for many centuries after I am gone, but their range is decreasing as the climate warms. Their seeds used to be spread in the dung of ground sloths, but without the sloths which went extinct 11,000 years ago, they can't propagate to higher cooler mountain ranges as effectively as conditions continue to warm up. I've watched with dismay as the forests of my youthful adventures in Southern California have burned up in massive wildfires. The giant 270 square mile fire in Angeles National Forest last year hit me especially hard. Wildfires have always been a fact of life in SoCal. Whether the increasing intensity and extent of the wildfires results from warming or from management issues, the forests will probably be replaced with species characteristic of a drier environment. My favorite Jeffrey Pine forests on Mt. Baldy and in Holcomb Valley may become a thing of the past. What's changing in your region? Not a particularly geologic entry tonight, but I have never had the chance to photograph a coyote from a reasonably close distance. The morning patrol at Stovepipe Wells Campground was in full swing today, and Wily E. Coyote was cooperating with yours truly. It could have been the breakfast burrito I was chomping on, but I wasn't sharing. If you visit a place like Death Valley, and feel a need to bring along Fifi and Princess, you are allowed to. If you wonder why they are supposed to stay on leashes, here is your answer. When the coyote appeared on the scene, I noticed that two little Yorkies were leashed to the bench in front of the store. Wily E. noticed too, and was coming over to investigate. The owner dropped his purchases and gathered up his little treasures in a hurry! 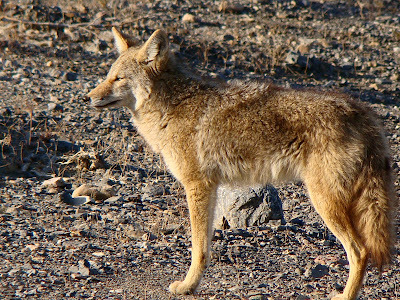 Coyotes are an American original. They evolved here, and have been found as fossils across the North American continent and especially in California, at the La Brea tar pits and numerous other localities. They are one of the few predators that has expanded its range, despite the efforts of humans to eradicate them in many places. The ones I've seen in Death Valley have looked pretty healthy (in part, no doubt, to the folks that left their pet food...and, uh, their pets outside at night). I enjoyed their night-time serenades! Looking over the blasted barren rocks of Death Valley National Park, one is struck by the apparent lack of life. A region that averages less than two inches of rain in a year, with summer temperatures regularly topping 120 degrees, is just not going to have a lot of moisture left over to support life. and yet life persists, and sometimes in incredible ways. Hundreds of species are found in the region, including dozens of endemic and endangered species. 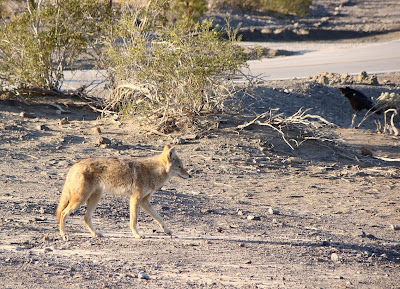 What is the last kind of animal you would ever expect to find in a place like Death Valley? 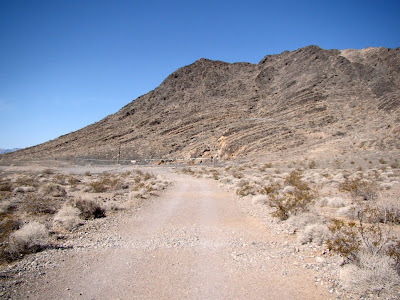 Here's a candidate: in an outlying part of the park, just over the border in the state of Nevada, there is a barren hillside of carbonate rock (limestone), that has been twisted upwards and fractured. Strolling towards the base of the hill, one notices a cavern opening surrounded by reinforced fencing. It's a deep cave, more than 900 feet, but surprisingly, it is filled with groundwater at a constant temperature of 92 degrees. Looking through the fence, one can see the small pool of water at the bottom of the narrow cleft. The monitoring equipment is a clue that something extraordinary lives here. It's a fish! And not just any fish, it is probably the rarest fish in the world, the Devil's Hole Pupfish. 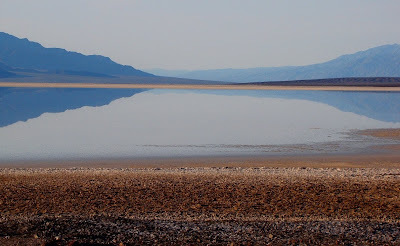 The species has lived in this little bit of water for the last 20,000 years, when it was isolated here by the drying of the glacial meltwater lakes that punctuated the Death Valley region. Through droughts, climate change, cooling, and in the last few years, interference by human beings, the little community of a few hundred individuals has grown, reproduced and died in this opening. A few decades ago, as many as 600 fish lived here, but by 2004 the population had crashed to just over two dozen individuals. The population had recovered by 2007 to 126 fish, but their continued existence will always be tenuous. They would have been extinct in the late 1970's had the Supreme Court of the United States not stepped in. It was an early major test of the Endangered Species Act. As can be seen below, major efforts have been expended to monitor the health of the population. It is not really possible to see the individual fish at Devils Hole, but a much larger and more stable population of a related species can be seen a few short miles away at Ash Meadows. The pool below is Crystal Spring, which produces 2,600 gallons per minute of 87 degree water. The Ash Meadows Pupfish lives in the pond and nearby stream, and is far easier to see, as we did today. 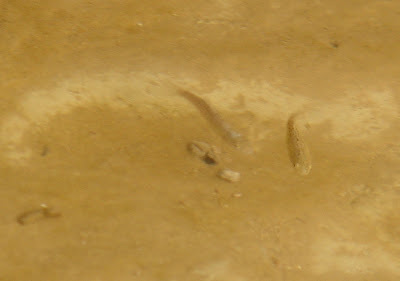 My picture of the Ash Meadows fish didn't come out, so I am slipping a picture of the Salt Creek pupfish from a previous trip. The Salt Creek fish live in the bottom of Death Valley not too far from Furnace Creek Resort. Four species of pupfish live in various parts of Death Valley, with some living in the hottest and saltiest water of any fish species on the planet. Others live in fresh water. They are all descended from a single species of pupfish that lived in the glacial meltwater lakes of the ice ages. An example of real resilience in the face of difficult conditions! Blogging from the road! There is actually some web access in Death Valley...slow, sensitive, moody, but it works, sort of. I'm out here with nearly three dozen students and volunteers, experiencing an unusually wet climate (correction: "weather", see the comments) by Death Valley standards. They've received a year's worth of precipitation (~2 inches!) in about three week's time. Most of the dirt roads are out of commission, and some of the paved roads are still impassable as well (Artist's Drive and Dante's View). Still, we have found plenty to do. There are certainly some unusual sights for Death Valley: morning dew soaking our camp in the morning, a bit of fog in the early morning, but best of all: a flowing river and a huge lake! The Amargosa River drains a huge region of western Nevada, but is generally dry most of the time except along a few precious stretches where ground water is forced to the surface. 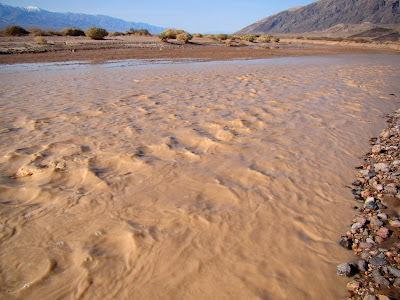 This year it is raging torrent (ok, a babbling brook) all across the bottom of the Death Valley graben. One could almost float an inner tube in it. The lake covers a fair portion of the ~100 square mile saltpan. Although it is large, it probably is no more than a foot or so deep, and will undoubtedly dry up in coming months as the weather warms up. It provides a beautiful foreground for viewing the snow-capped peaks of the Panamint Mountains. Let's see...record snowfall in Washington, D.C. and Baltimore...it must be field trip season in California! We leave tomorrow on a five-day trip to see the most geologically fabulous national park in the country: Death Valley. Conditions are expected to be clear and sunny, with highs in the upper 70's and lows in the upper 40's. This is not to say that all is flowers and sunshine in the state. Southern California has been hit by a series of very wet storms in the last few weeks, and the huge burned out area of Angeles National Forest has had a big problem with mudflows and mass wasting that has damaged dozens of homes. And despite all the rain and snow in our state, the drought is not yet a distant memory. California's population has reached the point that even with normal precipitation, we barely have enough water to meet our needs, and the farmers are still hurting. Still, this is an incredibly pleasant time of year to visit Death Valley. The region received several inches of rain in recent weeks, and the flowers should be beautiful (in late March and April, actually). We've had trips that included horrific duststorms, snow, rain, and flashfloods. But mostly it is nice, and the night-time skies are brilliant with stars (the Zodiacal light is especially visible in the dry desert environment). I especially enjoy walking out from our campsite onto the Death Valley Sand Dunes at night; it is a fascinating environment in the dark, with the ghostly dunes and uncertain horizons. Death Valley has the broadest spectrum of rocks of any national park I can think of. Except for the Archean, all the major periods, eras and eons are represented, including a stratigraphic column that is more than 5 miles thick (compared to 2 or 3 miles at Grand Canyon) reaching across 1.7 billion years. Numerous examples of volcanism, folding and faulting can easily be observed. And for the geomorphologists, there is a rich collection of alluvial fans, playas, horst and grabens, and salt pans. For the photographers, it is paradise. There is a spotty history of wi-fi coverage in the park, so posts may be spotty for the next week, but I'll try to keep in touch. Seriously though, to my friends back east, stay warm and safe in the storms. The photo is the panorama from Zabriskie Point, with Manly Beacon just left of center, and the Panamint Mountains in the far distance. From the summit of the Panamints at Telescope Peak to the bottom of Death Valley at Badwater, the elevation difference is more than 11,000 feet. The sedimentary rocks in the foreground were deposited in a fault graben that predated Death Valley, in Miocene and Pliocene time, around 5-13 million years ago. If you are a teacher, you know that one of the chores of an otherwise fulfilling career is the massive pile of grading which must be done. I swear sometimes I am narcoleptic or ADD, because if I sit in a quiet room with a stack of papers needing to be reviewed, I will be asleep in minutes. I have to have a distraction. As such, there are about three dozen movies on my favorites list that I can watch over and over while grading. Since I know the plot, I don't have to devote my entire attention to the movie, and so the grading eventually gets done. Unless a movie like Maverick comes on, the 1994 version with a pre-completely crazy Mel Gibson, Jodie Foster and James Garner. Don't get me wrong. I love the movie. But it has the most interesting geographic itinerary of almost any movie I've ever seen. Now, most of you know that movies like the Indiana Jones series, the James Bond movies, and the Bourne trilogy are well-grounded in their geography. Spielberg puts a little red line on a map along with flying airplanes to show where his characters are. The others label the latest exotic locale on the screen. Since the Maverick story was not so rooted in the place, they didn't do anything like that, but by carefully watching the background of the movie scenes, I have been able to discern that Bret Maverick and his co-stars completed one of the most epic of western US journeys in history. I've tried to map the approximate path they followed on the GoogleEarth image above. What they did was almost superhuman, given the transportation technology of their time! If you are not a Maverick fan, you are forgiven for not reading any further. If you are, enjoy. If you haven't seen the movie, check it out, but spoilers lie ahead. The movie opens with a hanging scene, but it is out of chronological order, and so will be dealt with later. 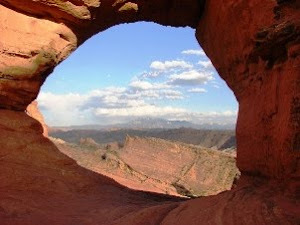 The main action for the first 40 minutes of the movie take place in the desert town of Crystal River, but the cliffs (Mesozoic sedimentary rocks) and the presence of a huge lake instead of a river suggests the Glen Canyon region. The lake wasn't there in the 1800's, but we could suggest that the town could have been a stand-in for the village of Hite, Utah, which was immersed in the waters of Lake Powell when the dam was built in the early 1960's. The town was established in the early 1800's as one of the few river ferry crossings on the Colorado River. Lees Ferry, a bit farther downstream, is another possibility. Indeed, the next scenes could bear this out. The runaway stagecoach is one of the more memorable set pieces of the entire movie. Maverick does an Indiana Jones-style ride underneath the stage coach, and then a John Wayne-esque jump onto the horse team to stop the stage at the brink of a vertical cliff over a raging river. Welcome to the Vermilion Cliffs (in the background), and the Grand Canyon of the Colorado! They are at the upper end near the aforementioned Lees Ferry, where river rafting trips start down the river. As steep and deep as the canyon seems in the photo, this is the shallow part of Grand Canyon. Maverick's life was saved by the geology; if the canyon rim was composed of anything besides Kaibab Limestone, he would have plummeted down the cliff and the movie ended prematurely. The limestone weathers in the arid climate into a spiky surface that provides good handholds. Sandstone or shale would have provided no traction at all. What follows must be one of the greatest untold stories in the annals of the American west: these three people, their stage driver dead, supplies lost, made a 400 mile journey through the hottest, driest landscape on the North American continent. It's not clear their precise pathway, but the shortest route would have taken them across the most desolate part of the Basin and Range Province, right through Death Valley, and on to the north end of the Owens Valley. What hardships they must have endured! The privation, the misery, the thirst, the starvation! And yet they arrived at their next movie scene with a complete (alive) team of horses, and hardly a hair out of place on their heads. It was here that they met a wagon train of missionary settlers who had been robbed. The women were, like the Donners a few decades earlier, apparently stranded on the east side of the Sierra Nevada. The Sierras are an imposing barrier to east-west travel; even today there are only a few paved roads crossing the crest, and in the movie they are next to the most rugged stretch of high peaks, the Palisades Crest, at over 14,000 feet high. They're in big trouble! But our heroes set off on a journey to wreak God's vengeance upon the heathen raiders. They ride 60 miles south with no supplies, tracking the brigands, finally cornering them near Whitney Portal, at the base of the highest peak in the lower 48 states (Mt. Whitney is the high towering peak in the background). After a shootout where all the bad guys get shot in the hand, they march the prisoners 60 miles back north to the wagon train. Then...the Indians "attack". In Bishop. In full feather headdress and war paint and all that. Maverick actually knows them, and they are dressed up for something else, so he goes with them on an epic journey across the High Sierra (the lowest pass is about 10,000 feet) to Yosemite Valley, a distance of around 100 miles at a minimum over rugged terrain. The native people of the Sierra and western Basin and Range are the Miwok and the Paiutes, neither of which used feather headdresses, and they lived in bark structures or wikiups, not tepees like the Great Plains tribes. It turns out the Indians are putting on a show for a visiting Russian dignitary traveling with a retinue and fancy wagon (wonder how they got it into Yosemite Valley in the 1880's?). The beautiful granite monolith of Half Dome can be seen in the backdrop, especially the scene where Maverick, dressed as a sick Indian, supposedly gets shot. That scene was shot from the vicinity of Washburn Point, a less crowded destination than nearby Glacier Point. Maverick gets the money his friend owes him and sets out again. At this point, the geography gets a bit muddled. Maverick is supposedly headed north to the big poker game, but he seems lost, because he is 150 miles south, back at Whitney Portal, when he is ambushed by the bad guys. They take him to the middle of a dry lake bed which I assume is in the Mojave Desert, based on the relatively gentle terrain surrounding the lake in the distance: maybe Silver Lake, or Searles, or Bristol? In any case, what is an old oak tree doing in the middle of a dry lake in the desert? Did the bad guys haul it out there? Oh well, in any case they took him a minimum of tens, maybe a hundred miles to find the right tree to hang him from. Inefficient bad guys if you ask me. And now the other epic western journey for the ages! 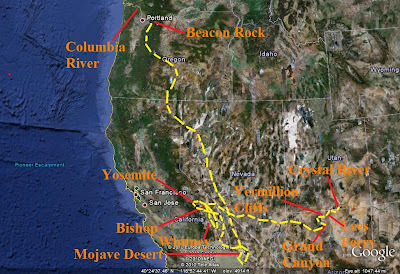 Four groups and individuals (the bad guys, Coop and Annabelle, Maverick, and the Russian) all make the trek from the eastern Sierra Nevada and Mojave Desert some 700 miles north across rugged and inhospitable terrain through Oregon to the Columbia River near Portland. The Paddlewheel Steamer is floating around Beacon Rock, an eroded volcanic vent that stands 850 feet above the river. For all the paddlewheeling, the boat never seems to move more than a mile or two from Beacon Rock. Was it treading water. Who knows? So there you have it, a real tour-de-force of movie sets across the American West. If you ever decide to follow the path I have outlined, take lots of food and water in your car! It would be a fantastic trip, truth be told, although I would start through the desert in the spring, before it gets too hot. What's with the underwear jokes? Letterman and Leno Superbowl Party, brilliant! "Lost" parody, cute but predictable at the setup. Oh, is there a game going on? "Man's Last Stand"? Didn't see the punchline coming; thought it was another beer commercial. Will only work once, though. First half ends with some surprises. Why are men in suits talking and talking? They remind of Talmudic scholars discussing Mosaic Law. Where are the ads and the Who? Oh, there they are. The "Who's" light show is very kinetic. The singers look kinda old. When did that happen? Metro PCS spot seemed kinda like stereotyping, and not so funny. Second half of some game begins. Ad analysis continues....OK, that was different. Onside kick, followed by Gordiron Knot of human beings. Almost as good as an ad. And a touchdown too. Ads are starting flag a bit. When Jesus turned the water to wine, the steward said the host saved the best for the last. Why aren't they doing that with Superbowl ads? Nice to see the Griswolds of National Lampoon fame again, so-so punchline. Another underwear commercial, for Coke. Pretty good visuals of the savanna though. Stupid e-trade babies again. It's old. For some reason I actually liked the Google commercial. Touching, and effective from a messaging point of view. Sometimes you can make a commercial cheaply and yet get your message across. OK, Jack in the Box bungee jumping. I actually liked the punchline; I think I appreciate the originality of the JB ad people more than most (including terrorist Jack blowing up the Boardroom; they only showed that one a few times). They're always...uh...different. Just when I thought I wouldn't see the Budweiser horses, there they are. With a cow. OK. The Denny's chickens are...bizarre. I give them points for adding Old Faithful and Yellowstone in a backdrop. The green police for Audi! That's the kind of innovation and creativity I like in a Superbowl ad, maybe the best of the day. Steve Martin being perp walked, check points for plastic containers. I've always imagined a world in which crimes against the earth were given the attention that we give to other kinds of crimes. Not that I want the green police to be knocking at (down) the door. It would just be nice to live in a world where the worst crime was littering (fondly recalling Alice's Restaurant). Thanks! I guess GoDaddy wants to be the "controversial" sleazy ad of the year...shameless, which means it will probably work for them. Doritos seems to be spending the most dough on Superbowl ads, but hardly any have really caught my attention. Game over, Saints win! Pretty good game! I was pulling for the Saints, and they turned it around. I thought they were doomed after the first quarter. The ads? I'll award a B-. They mostly stayed away from fart jokes and sleaze, but lots of them just weren't creative. My favorite of the day remains Audi's green police. Pure genius! I look at all my geoblogospheric friends living in the path of that horrendous snowstorm sweeping across the eastern U.S., and I think to myself that California is not all that bad a place to live. In fact it is a wonderful place to live! I have to drive through the tule fogs sometimes, and it is dry, dusty and hot in the summer, but it is not far to the beach or to the snow. I can visit the snow if I choose to. I walked out of the house this morning and smelled chlorophyll in the air. The daffodils in the picture are from my front yard; they bloomed yesterday. Back to the Other California soon. 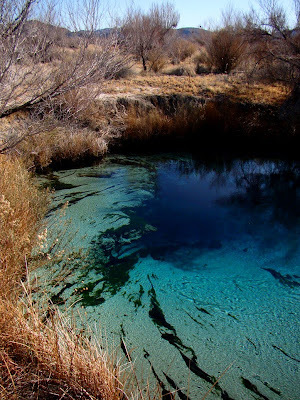 In the meantime, Nevada has some very interesting hidden places, and Silver Fox at Looking For Detachment has been exploring some of them in a nice blog series; this is a good place to start, a compendium of posts on Caliente region. The latest series is an investigation of the Jarbridge region, a very isolated corner of an isolated state. I spent several years at the University of Nevada, Reno, and grew to love this fascinating state. Check it out! To those friends back east, good luck in the storm. I will be thinking of you all; be safe and warm! The Other California: Be a Geotripper Geoblogger for a Day! Your host in the exploration of the Other California has been to a lot of places, but he hasn't been everywhere, and he didn't have a decent camera for most of his life, so he knows that he has overlooked some absolutely fantastic localities in this incredibly diverse state. A number of you have suggested some places that should be included, and I'm all for adding some more, but I need your help (I'm talking to you Forest and Kurt, and other commenters)! Be a Geotripper Geoblogger! Write up a short narrative about your favorite place, include a few nice pictures, and be featured here! Be seen by dozens of readers! For the time being, I am interested in the Klamath Mountains, the Cascades and Modoc Plateau (other provinces will be featured later). If you've got material on Ahjumawi Lava Springs, the Thousand Lakes Wilderness, or the Warner Mountains, I would love to hear from you (I've always been curious about them), but any interesting place is worthy! If you would like to submit something, send the text and jpg photos to hayesg (at) mjc.edu, and I will put your submission through a harrowing vetting process with rigorous peer review, and will probably publish it about three minutes after it arrives. Of course you will receive full recognition and credit, and I will pay you exactly as much as I earn from blogging ($0.00 per hour, per day, and per week). I look forward to seeing and featuring your favorite places! The Other California: Chaos! And Jumbles Aren't Always Word Puzzles. We are in Lassen Volcanic National Park, a place that is on all the postcards, but the park receives roughly a tenth the visitation of a place like Yosemite, somewhere around 350,000 people a year. In the last post, we visited the volcano that isn't there, Mt. 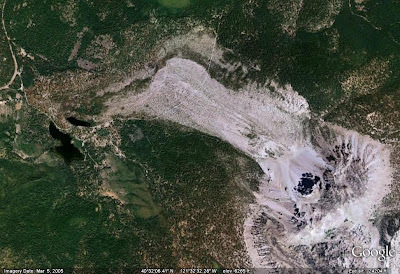 Tehama, a large stratovolcano just south of Lassen Peak that succumbed to erosion during the last 400,000 years. 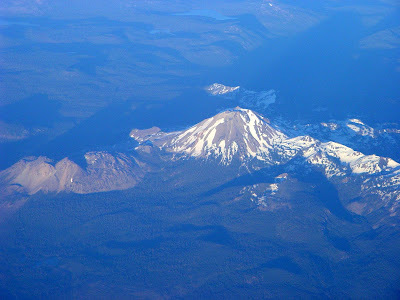 In the aerial photo of that post, another barren looking group of mountain peaks could be seen to the left of the Lassen Peak (likewise in the picture below). 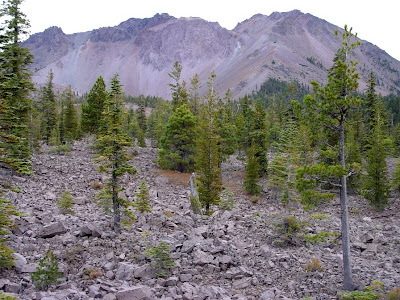 Aside from a cinder cone in the eastern part of the park that erupted in the 1600's, these cones, the Chaos Crags, are the youngest volcanoes in park, having erupted about 1,100 years ago. 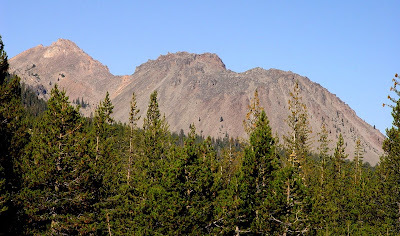 The Chaos Crags are a series of six consecutively erupted plug domes similar in nature to Lassen Peak. They are named, very creatively I might add, domes A, B, C, D, E, and F. The lava, midway in composition between rhyolite and andesite, is called dacite, which usually is highly viscous (resistant to flow). As a result, the term 'lava flow' hardly applies; these volcanoes squeeze out of the ground in a manner similar to toothpaste. Seen from ground level, the domes look barren, steep, and maybe even a bit...unstable. In that context, look at the forest in the foreground of the picture below (taken from the east side of the Crags): it is an old-growth forest of fir and lodgepole pines. No soils have accumulated on the slopes of the cones in a thousand years, so almost no trees grow there. A look from the west side of the Crags presents a different picture; notice the open forest and stunted trees. What's going on here? The answer comes to us, courtesy of GoogleEarth (a wonderful thing, that GoogleEarth) below. From the barren side of Dome C (lower right hand side), a series of three large debris avalanches flowed northwest until they slammed into the side of Table Mountain and turned to the west. The avalanche deposit is more than two miles long, and covers 2 1/2 square miles. It blocked Manzanita Creek, forming two attractive lakes, Manzanita and Reflection. Carbon 14 dating of trees in the debris indicate an age of around 300 years, practically yesterday in geological terms. The jumbled and chaotic landscape of the avalanche is called the Chaos Jumbles (that is a great geologic name!). I remember camping several decades ago at Manzanita Lake, and thinking what a nice campsite it was. The sites were spread out in this lumpy landscape so RV's weren't parked side-by-side. I didn't know at the time that it was because I was in the midst of a geologically recent avalanche. The National Park Service came to this realization in the 1970's (or was it right after the St. Helens eruption? Someone help me here! ), and worrying about possible future events, closed a large portion of the campground, as well as some of the area facilities including a camp store and the historic Loomis Museum. In recent years the Loomis Museum has reopened (and has some great geologically themed exhibits). A close examination of the boulders in the avalanche deposit reveals some interesting features. The dacite includes some large crystals of plagioclase, hornblende, biotite and quartz. It also includes some large blebs of an entirely different rock (called enclaves). These blebs (blobs?) are fragments of a more basaltic magma that bubbled up into the dacite magma when it was still molten. These incidents of magma mixing play a huge role in controlling and influencing the magma systems underneath the Lassen region, and may even provoke eruptions (see Clynne, 1999, for example). Research is continuing on the area. An excellent geologic map of Lassen and Chaos Crags is available online here. Clynne, M.A., 1999, Complex magma mixing origin of rocks erupted in 1915, Lassen Peak, California: Journal of Petrology, v.40, p. 105-132. I'm channeling Lee at Arizona Geology, but not all of our readers overlap, I'm sure. A team of NSF geophysicists is on the ground in Port-au-Prince, Haiti, doing some research on ground movements related to the horrific earthquake a few weeks ago. They are also blogging about their experience, and a quick look shows they are describing life on the ground for the Haiti community in the aftermath of the quake as much as they describe the GPS work they are doing. The pictures are both hopeful and heartbreaking. Check it out! And give; we can't forget Haiti just because it isn't in the headlines anymore. UPDATE: Well worth a read; an American survivor of the earthquake writes about the country she grew to love, and the acts of bravery and kindness she witnessed after being trapped in the rubble. 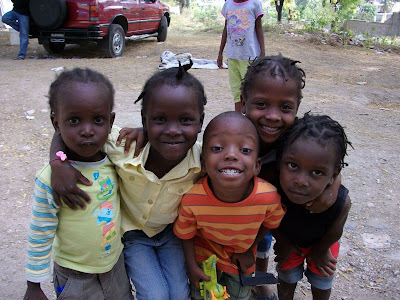 Haiti should not be forgotten; help them, not just by giving food for a day, but by helping them rebuild their country.